* PVC MINI FLOAT VALVE is just what you need to keep water supplied to your project. NO METAL PARTS = NO RUST/LEECHING. This is well designed and ruggedly built with tough PVC. You'll get great service from this float valve for a long time. * JUST RIGHT FOR PONDS, AQUARIUMS, CHICKENS, LIVESTOCK WATER TROUGH. Keeps the water level right where it should be in your pond or aquarium. No more worries about a mechanism that gets stuck or corroded and overflows or fails to fill. Includes an adjustable arm for use on ponds, swimming pools, etc. 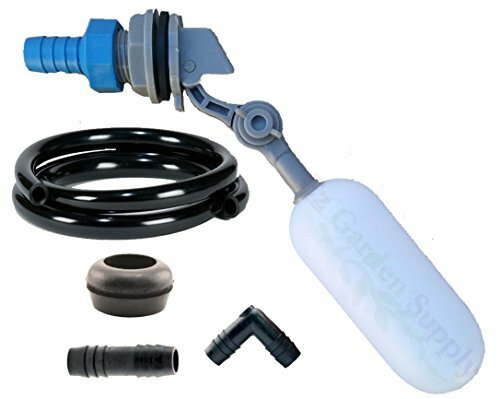 * PERFECT FOR HYDROPONICS TANK RESERVOIR. Now you can get maximum growth and yield with the reliability and precision of this excellent Mini Float Valve. It's been engineered for trouble free operation so you can set it and forget it. * 100% MONEY BACK GUARANTEE ensures this will quickly become your favorite no-risk purchase. Many people are buying several of these to outfit their entire operation. HURRY AND BUY NOW while we have this very popular model in stock. This makes a great birthday or holiday gift for anyone with a fish tank, pond, or agricultural project. Also wonderful for friends, family, and co-workers - anyone who wants worry free water flow.